Diamond eyed the unfamiliar woman curiously, sniffing at her hand when she held it out to him and then gently nudged her shoulder with his nose, giving a small, deep nicker in reply. Danny watched the two of them with a small smile on his face. Diamond always had been a friendly horse, especially to the girls. However, he didn't usually let men close to him, at least not just any man. When Diamond first came here, Danny had been the only one who could handle him, which made him Danny's best friend really quickly. But he became more open and friendly to everyone pretty fast. "He's a real lady's man... well, used to be. Now he's almost an old man." Danny said, petting Diamond's neck. Nicole giggled a little when Danny said that. "Is that so Diamond?" she asked after looking over to Danny. It was clear that Nicole was beside herself to be seeing a horse up close like this. It made her feel like a little girl again. "You seem like a good bloke Diamond." she said to her while standing there. Danny noticed that, while he stood next to Nicole, watching her with Diamond. The horses snorted a little, nudging her shoulder. It was just one of the signs that he actually liked Nicole. And that wasn't something Danny would have expected like this. "He likes you." Danny told her with a small smile. "Well, Diamond is father to four foals, all of which still live here at the stables. Well, they're not exactly foals anymore, now. You'll be learning how to ride on one of them. She's a real gentle school horse, while she can have a temper, but she's easy to handle for beginners." Nicole looked at Danny when he said that to her, smiling a little. "Ace" she said to him, nodding a bit at the same time. "Whats the name of this horse?" she asked while gently pulling her hand back from Diamond, her eyes still on Danny as she said that to him. Instead of saying something in reply, he took Nicole by the hand and led her down the main hall of the stables. He stopped just a few stalls away from Diamond's and had her meet a beautiful, dark brown mare, about the same height as Diamond. 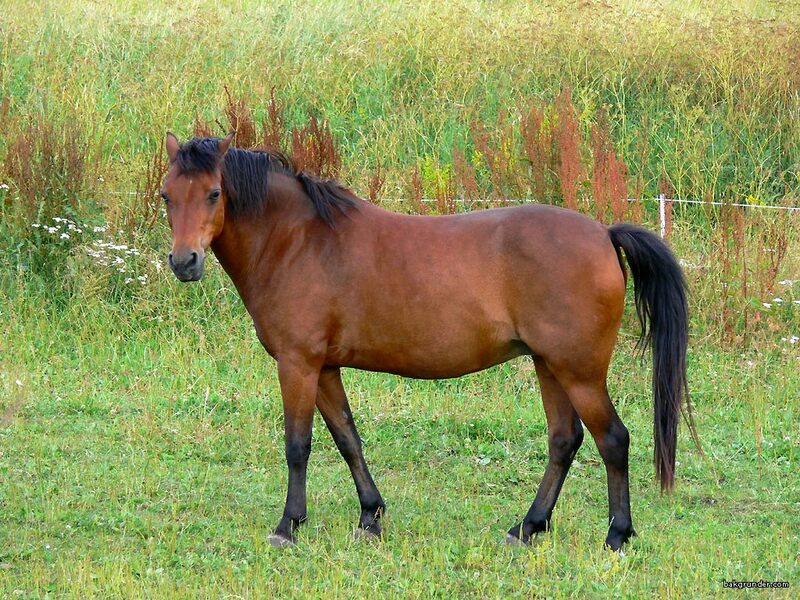 Her mane and tail were almost black and she had a tiny white spot on her forehead, just where her mane ended. "There she is." he said to Nicole, letting the horse sniff at his hand before gently rubbing her nose. "That is Starlight. Or Star as we call her." The mare had a gentle look in her dark brown eyes as she looked at the two humans in front of her. Even though she was just a horse, it was rather obvious that she had a gentle soul, a mild character, but also some temper. She was a spirited horse, but like Danny said, easy to handle and a loyal companion if she trusted you. Nicole nodded in reply as she looked at the mere, then gently held her hand out to her. "Hello Star" she said to her in a gentle tone while watching her. "You're a beautiful gal." she added while watching the mere, smiling a little as she said that to Starlight. The mere stretched her head out and sniffed at Nicole's hand. Her warm breath brushed against her hand, when she snorted quietly at the new human, her new friend to be. She pulled her head up and looked at the two humans, eying them curiously. Danny gently rubbed her neck and smiled a little bit. "You like the attention, huh?" he said to the horse, who snorted again and paw her hoof on the ground. Nicole smiled when Star did that. "Looks like she does" she said to Danny while pulling her hand back. "She's a beautiful horse Danny." she said honestly after looking over to him. Nicole took Danny's hand, then looked back at Star, smiling a little at her as she stood there. It was clear that Nicole loved seeing the horses that Danny and his family had here. Danny nodded in reply to Nicole's comment, gently patting Starlight's neck. He's always liked her, from the moment she was born. She was the second foal that Diamond fathered and Danny had been lucky enough to be there when she was born, 6 years ago. 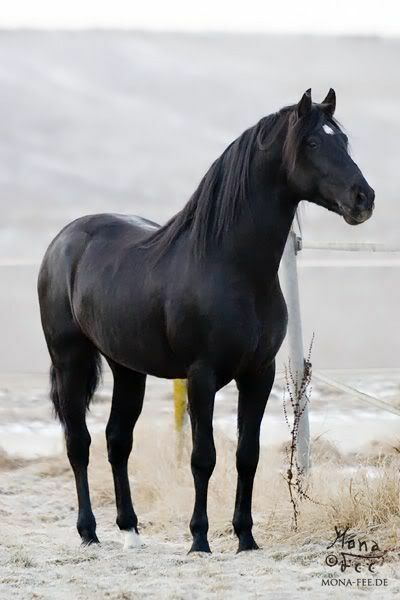 The oldest of his children was a beautiful stallion that looked exactly like Diamond. The only difference that kept them apart was that his left foot up to his fetlock was white instead of black like the other four. That's what got him his rather strange name "Calcetín". He was 8 years old, came into this world when Diamond was about 11. "That she is." Danny replied. "Although she looks nothing like Diamond, except for that little star on her forehead. She comes after her mother, both in looks and in her behavior." At the same time as he said that, Calcetín, who lived in the stall next to his sister Starlight, stuck out his head and nudged Danny's shoulder, who stumbled a little, because he was taken by surprise this time. But he chuckled a little and turned his head to him. "And this bold fellow is Calcetín. Means sock in Spanish. He's Starlight's big brother and the one I'm riding when I'm here, since Diamond's too old to be ridden now." Nicole looked at Calcetín after he nudged Danny, nodding a bit when he told him who he was. "Calcetín its not right to surprise people like that." she said to him in a gentle tone while watching him. Nicole watched the horse as he looked at her and snorted softly at her. Nicole tilted her head to the side when he did that. "Well I'm sorry, but its true." she said, her tone still light as she said that. Danny couldn't hold back a small chuckle, watching Nicole and Calcetín just now. The beautiful stallion lifted his head up for a moment and then nudged Nicole's shoulder. He actually liked her. "Well, it's alright." Danny said with a small chuckle. "Should've paid more attention to my surroundings. He just wanted me to greet him." Danny reached up and gently patted Calcetín's neck with his hand, then gave him a good rub, too. He liked the stallion very much, that was obvious in the way that he treated him and the other horses, too. The city boy enjoyed his time around these gentle giants. Nicole looked at Danny and nodded in reply when he said that to her. She then looked back to the horse and smiled at him. "You're a handsome bloke" she said to him, smiling a little as she said that after he nudged her, Nicole giggled a bit when he did that to her. "And you a funny one too" she added while watching him. Danny smiled a little, watching Nicole interact with Cal. He was a curious horse and unlike his sister and most of the other horses not shy at all. He was actually a pretty brave horse. But also a very loyal friend and companion, who would do anything to protect his rider, but especially Danny. He was close to him, although they have been apart for such a long time. "I actually helped him into the world. Back then I had a couple of weeks off work, because I had piled up a lot of over time... and a case that got to me, so I spent about a month and half up here. He had to be fed with a bottle..." Danny said, thinking back to the day the beautiful stallion was born. He really did make good use of that time he couldn't go to work. It was a case he never spoke about. "Awww" Nicole said in reply as she listened to Danny tell her that. "So there is a softer side to you." she said to him in a teasing tone, taking Danny's hand as she said that. She then leaned up and kissed him on the cheek. "You're such a charming and caring bloke." she whispered to him. Danny chuckled softly in reply to her teasing words. He knew the two different sides of him just too well. While he actually was a caring guy with a soft side for things he loved or people he cared about, he had to be tough and cold as an Agent sometimes. While he still was a caring Agent, he couldn't let things get to him. Danny also knew that keeping these two sides seperated and the Agent out of his private life, he didn't always manage to do so as good as he wanted to. With all the things he's seen in his life and during his career, part of his Agent side was always present. "Who would've thought." he said to Nicole, partly serious. Nicole watched him, then broke into a giggle fit. The horse watched Nicole as she did that, shaking his head a bit. "Sorry Danny" she said while composing herself. "Its ace to know your the kind to care for others." she added while watching him. Danny smiled just a tiny little bit, for a moment forgetting the reason why they actually came here in the first place. But those feelings would come back soon enough, they would have to head back to the house and get ready for the day soon eough. "Well, you knew that before." he countered. "Otherwise you wouldn't be here with me now." Calcetín snorted softly and rubbed his nose on Danny's shoulder. He sensed that something was up with his friend, even though they hadn't seen each other for a while. But horses had keen senses, they always knew. Something that Danny liked about them. Nicole nodded in reply when Danny said that to her. "Aye" she replied, the smile still on her face as she said that to him. She noticed that Calcetín was rubbing his nose on Danny's shoulder. "What is it mate?" she asked the horse while watching him. She had a feeling that Calcetín knew something was going on between them. "You know that I'm dating Danny, don't you?" she asked. Danny looked at Nicole, raising his eyebrows just a little bit, before he softly rubbed Cal's nose with his hand. Cal's behavior had a different reason, it wasn't about Danny and Nicole, right now it was just about how Danny felt. Cal had always had a special sense for him, probably because he practically raised him when he was a little foal. At least for a months and a half. And then he always spent a lot of time with him, when Danny was up here again. "He probably does, but that's not the reason for him keeping contact with me." he explained in a gentle voice. "He senses how I feel, even though I might put up a tough face. He always knows when something's up." Nicole looked at Danny when he said that to her, nodding a bit at the same time. "I see" she said softly while watching Danny before looking back at Cal. "You know he lost someone close don't you?" she asked in a gentle tone while watching him. Calcetín lifted his head and snorted softly, slowly nodding his head, before his dark brown eyes rested upon Nicole for a while. The beautiful stallion didn't know that Danny lost someone close to him, he just responded to his aura, the sad vibes that he sensed coming from his human friend. Horses just sensed things like that. He sensed that Danny was sad, confused and a little frustrated. "Well... not exactly." Danny said quietly. "Horses react to vibes, charisma or whatever you want to call it. He senses my sadness." Nicole looked at Danny when he said that to her, then nodded. "I see....Merlin is the same way." she added gently while standing there with Danny. She then looked back to the stallion and smiled a little. "Danny's going to need yours and mine's help while we are here." she added in the same gentle tone while watching the horse as she said that to him. Danny nodded a little, then closed his eyes for a moment, when Calentín gently nuzzled his hand in which he had a piece of carrot for him. He liked the feeling of the warm, soft lips on his skin and the horse's warm breath. It always took him back to the first time he was around horses and it always made him feel safe. For Danny horses weren't just animals to ride on, they were friends as well. And Cal had become a special friend to him. "Not that I would need help... just some company." he said quietly and pulled away from the horse. He had wanted to go for a ride, but he didn't want to leave Nicole behind, all by herself in the stables. So Danny postponed that plan. Nicole looked over to Danny, seeing him pull back from the horse. She had a feeling that she would have to wait for her riding lesson, not that it bothered her. They were here for something that had a bigger need at the moment. "Danny....when the funeral is over, you and I should have a night out for ourselves." she said to him in a gentle tone. There was a caring sound to her voice as she said that to him. Danny turned and faced her, after she said those words to him. Well, maybe she was right, but at the moment, his mind was somewhere else. He hadn't really made any plans for their stay at his grandmother's, he would decide with Nicole what they wanted to do while they were in Nashville. Sure, he would love a night out with Nicole, just to be with her and spend some quality time with her, but he still wanted to take her out for a ride. "Yeah... maybe." he replied eventually. "The funeral's in the morning... it'll probably be over by noon and my grandma didn't want everyone to drive out here afterwards so she arranged a little get-together at a small restaurant nearby. I don't want to cancel your riding lesson after that, so... how about I take you out for dinner the day after tomorrow?"